We’d love your help. Let us know what’s wrong with this preview of A Dog Called Kitty by Bill Wallace. The puppy was small and fuzzy, with a friendly, wagging tail -- and Ricky was afraid of him! No wonder, since he was attacked by a dog when he was just a baby. So when a stray puppy comes sniffling around the farm, Ricky tells it to get lost. But the puppy keeps trying to play with Ricky. And every time Ricky's Mom feeds the cats, the little dog comes running. The cats are The puppy was small and fuzzy, with a friendly, wagging tail -- and Ricky was afraid of him! But the puppy keeps trying to play with Ricky. And every time Ricky's Mom feeds the cats, the little dog comes running. The cats aren't sharing their food, however, and the poor pup is slowly starving. If Ricky doesn't overcome his fear, the little puppy may die -- but if he lets himself get close enough to feed it, he may find the best friend he's ever had! To ask other readers questions about A Dog Called Kitty, please sign up. is this based on a true story? Liv I don't think it is, it might be, but as far as I know it's all fiction. 5th - when you expect the happy ending because they survived the fight, a load of pipes falls on the pup and kills him. REALLY?!??! This review has been hidden because it contains spoilers. To view it, click here. 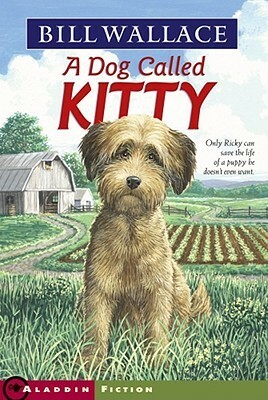 A Dog Called Kitty is the first "novel" I ever read. I was in the second grade and I remember balling my head off over Kitty's death while sitting in the bathtub. It was definitely an eye-opening experience. To be completely honest, it's been far too long for me to give this book an accurate rating, but after 20+ years the fact that I still remember reading this book as well as several specific scenes is enough for me to give it 5 stars. This book helped to create in me a love for reading. My daughter got this book from the library and I had to reread it. It was my favorite book when I was her age and it still made me laugh and cry like it did back then. Such a great book! Oh wow, this was my most favorite book when I was a kid! I must have read this book literally HUNDREDS of times growing up. I remember I had an autographed copy of the hardcover edition. I obtained it when I met Mr. Wallace when he came to my school when I was in third or fourth grade. I think it had just been published. This book was the beginning of my love affair with reading. Thinking about it, I am now sad that I don't know what happened to my autographed copy. I very highly recommend this b Oh wow, this was my most favorite book when I was a kid! I must have read this book literally HUNDREDS of times growing up. I remember I had an autographed copy of the hardcover edition. I obtained it when I met Mr. Wallace when he came to my school when I was in third or fourth grade. I think it had just been published. This book was the beginning of my love affair with reading. Thinking about it, I am now sad that I don't know what happened to my autographed copy. I very highly recommend this book to anyone. Parents, this is a safe book for your kids to read but I will warn you, it deals with some very tough and emotional issues (fear, loss etc.). I remember crying near the end of it every single time I read it. But, I wouldn't trade the experience of reading this for the world. I was extremely disappointed by this book. I'm an English tutor and my student chose this book for us to read together, but had I known what was in store I would have selected something else. To begin with, the grammar is terrible. Fragmented sentences completely threw off the flow of our reading, which my student already struggles with. In addition to its poor structure, I found the story extremely violent and was concerned by what these "children's books" are teaching the youth. For example, t I was extremely disappointed by this book. I'm an English tutor and my student chose this book for us to read together, but had I known what was in store I would have selected something else. To begin with, the grammar is terrible. Fragmented sentences completely threw off the flow of our reading, which my student already struggles with. In addition to its poor structure, I found the story extremely violent and was concerned by what these "children's books" are teaching the youth. For example, the main character, Ricky, almost lets the dog, Kitty, starve to death in the beginning. Rather than feed the starving pup, he thinks it would be best to let the dog die. Throughout the book Ricky continually insults and threatens his dog, calling him a "coward" and saying he'll "smash his head with a rock". The main character is extremely violent and shows very little regard for the dog as a creature that is to be loved and respected. On the topic of dogs, I was also disturbed by the fact that this book fed into the mania and panic surrounding certain dog breeds, specifically German Shepherds and Dobermans. They were characterized as vicious, bloodthirsty monsters and painted as the villains. I have worked with dogs professionally for years and have come across aggressive dogs of all breeds, as well as dogs characterized as "dangerous" that posed no such threat. This one was a tear jerker (I didn't know going into it) but a good, enjoyable read. This was a good book. I could not get my eyes out of this book, because it was too good. It reminded me of Bill's other books, because it was about a dog. However, certain parts of it did not make sense (spoiler alert). The fact that the puppy lived that long with very little food did not make sense, nor how he climbed the fence like a cat, or how he lived through the dog attack (I guess the last one makes a little more sense). This is a story of love, death, and fear. Overall it was a good boo This was a good book. I could not get my eyes out of this book, because it was too good. It reminded me of Bill's other books, because it was about a dog. However, certain parts of it did not make sense (spoiler alert). The fact that the puppy lived that long with very little food did not make sense, nor how he climbed the fence like a cat, or how he lived through the dog attack (I guess the last one makes a little more sense). This review has been hidden because it contains spoilers. To view it, click here. This book would have been a lot better if it had been one of the few where the dog doesn't die. There are several really great scenes where Kitty helps Rick overcome his fear of dogs including really big, mean dogs. The story even circles back to the second encounter Rick has with a dog to prove that he isn't too scared to stand up for someone anymore. It's a good lesson, but it could have ended without Kitty dying in my opinion. I believe I first read this book when I was in middle school. And, yes, I cried. I've re-read it a number of times since then because it's a fast read; one quiet afternoon is all it takes. And, yes, I still cry. I'm a sucker for stories like these. I still have the original book from middle school and hope that my son & daughter read it, too. I think that this book is a good book because it talks about a relationship between two enemies who became best friends. Sometimes it's good to go back to your childhood. This book was so sad and kind of poignant...I felt like crying at some parts but all in all it was really good. Such a good book, almost brought tears to my eyes! This book was a favorite when I was young, read it a few times and each time made me cry. this book was very disciptive the ending was very sad. I’ve recently read the book A DOG CALLED KITTY by Bill Wallace. The main character in this book is Ricky and a dog. This book takes place on a farm in Oklahoma. Ricky was once attacked by a vicious dog when he was a little boy. So, dogs became a fear to him. One day a dog wondered into Ricky’s farm. The dog would not leave and kept trying to play with Ricky. The dog was a stray so, when Ricky’s mom would feed the cats the dog would come running. However, the cats wouldn’t share their food. Thi I’ve recently read the book A DOG CALLED KITTY by Bill Wallace. The main character in this book is Ricky and a dog. This book takes place on a farm in Oklahoma. However, the cats wouldn’t share their food. This is the main conflict in this story. If Ricky doesn’t overcome his fear of dogs and help the dog out then, it may starve to death. I relate to this story because I have once been attacked by a pit bull before but, I didn’t let that become a fear like Ricky did. My favorite part about this book is how friendly and nice the book puts the dog out to be and how he/she is so willing to play with Rick. I would recommend this book to kids who may be afraid of dogs. This book may help them over come their fear against them. Ricky’s been fearful of dogs ever since he was attacked by one a few years back, but the stray puppy on his farm is going to starve if he doesn’t confront his fear. Little does Ricky know, he needs this dog just as much as the dog needs him. Genre: Contemporary Realistic Fiction - This book is set in fairly recent time and tells a timeless story about a young boy facing his fears and trying to survive the bullies at school. The story isn’t true, but it could easily happen in real life. Reading Le Ricky’s been fearful of dogs ever since he was attacked by one a few years back, but the stray puppy on his farm is going to starve if he doesn’t confront his fear. Little does Ricky know, he needs this dog just as much as the dog needs him. Writing Mentor Traits: Voice - Author Bill Wallace writes this book in Ricky’s voice, taking on a casual, conversational tone rather than using formal grammar all the time. Students could practice using a conversational approach to their writing as well, especially when it might help make their characters more lifelike. Other Classroom Uses: This book could be used to address bullying and to open up a conversation about courage and facing our fears. This book was originally published in 1980, and even though it never mentions it, I think it was supposed to be set years before that. So adult behavior is going to be shocking for anyone reading it now. The Dad announcing he was leaving and taking his kids with or without his wife alone would make most kids cringe. The story is pretty good if you can get past the way people used to behave. The boy has a fear of dogs and he learns to love this stray pup. The scene where they find the cow and her c This book was originally published in 1980, and even though it never mentions it, I think it was supposed to be set years before that. So adult behavior is going to be shocking for anyone reading it now. The Dad announcing he was leaving and taking his kids with or without his wife alone would make most kids cringe. The scene where they find the cow and her calf is pretty amazing. It gave me chills. Bill Wallace was an American teacher and later an author of children's books. He started writing to quiet down his fourth grade students, who loved his stories and encouraged him to make “real” books. Bill Wallace grew up in Oklahoma. Along with riding their horses, he and his friends enjoyed campouts and fishing trips. Toasting marshmallows, telling ghost stories to scare one another, and catching Bill Wallace was an American teacher and later an author of children's books. He started writing to quiet down his fourth grade students, who loved his stories and encouraged him to make “real” books. Bill Wallace grew up in Oklahoma. Along with riding their horses, he and his friends enjoyed campouts and fishing trips. Toasting marshmallows, telling ghost stories to scare one another, and catching fish was always fun. Bill Wallace has won numerous children's state awards and been awarded the Arrell Gibson Lifetime Achievement Award for Children's Literature from the Oklahoma Center for the Book. Bill Wallace died from Lung cancer on January 30, 2012. Former elementary school teacher; West Elementary School, Chickasha, OK, principal, since 1977, and physical education teacher. Speaker at schools and universities in various states, including State University of New York and University of South Florida.